Blazers are definitely among my all-time favorite fashion items. I own so many of them in various colors and styles, mainly because they have the power to instantly make an outfit look chic and well put-together. Today I´m wearing purple trousers paired with one of my favorites black blazers. 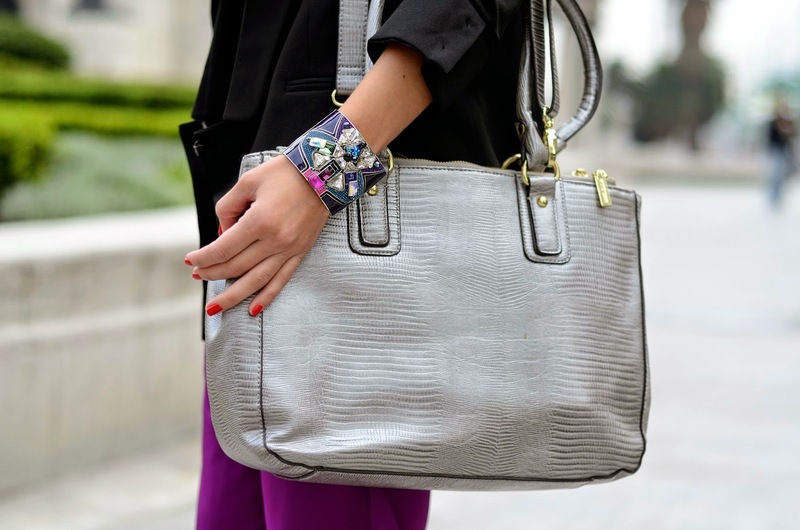 This outfit is simple but stilysh, also I´m wearing this cute silver bag from Anne Klein and my chunky swarovski bracelet. Hope you like it! Los Blazers son en definitiva uno de las prendas preferidas por el mundo de la moda desde siempre. Yo misma tengo muchos blazers en diferentes colores, cortes y texturas, tal vez porque ellos aportan al look un toque diferente e inmediatamente puedes crear looks increíbles cuando los usas. Este outfit es simple pero igual de estilozo, también llevo un bolso en color plata de Anne Klein y este bello brazalete de Swarovski. Espero que les guste. Wow these purple pants are gorgeous! So classy paired with the black pieces! Love this look! Me encanta ese toque morado!!!! No recuerdo haberte visto ese pantalón antes, Gaby, pero luces fantástica. Saludos de Juaco. Love pants and the color of them! Amazing look! Very chic. Love the color of those pants! So stylish as always dear! Me encanta que siempre seas tan natural en tus fotos. love this look and those trousers are amazing love the color! Hola, el pantalón tiene un color precioso, me gusta como lo has combinado, saludos. I love your pants are amazing! 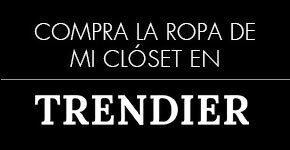 Tu si que sabes usar prendas poco convencionales! Love the pants and bracelet.Great styling! Great pants! I love the colour! I actually have a pair of purple pants too. I should def break them out again this fall! Definitely a simple outfit but so, so chic! I love the color you pants so much and I love blazers as well! I agree, it can transform an outfit! I love your pants! Such a cool vibrant colour! Super stylish and lovely look! Lovely blog! Love your style, your photos, your blog. Amazing suit combination. The top and blazer go perfect together with the pants. Love that the purple comes back in the bracelet. Looking stunning amiga!